Tatiana Classic Cognac delivers an earthy and floral cognac taste in a traditional 6x44 Lonsdale vitola. Great tasting cognac smoke flavor with great aroma!! Good cigar, excellent flavor. I will buy again. One of my husband's favorite cigars! Tatiana Classic Cognac is rated 4.6 out of 5 based on 12 customer ratings. I would like to try the cognac cigars. Are they as sweet as the cherry or chocolate? The Tatiana Classic Cognac does have a sweetness to it which is paired very well with the mild Dominican filler and smooth Indonesian wrapper. Some find the Tatiana Classic Cherry and Chocolate to be sweeter than the Cognac, though this all depends on palates. 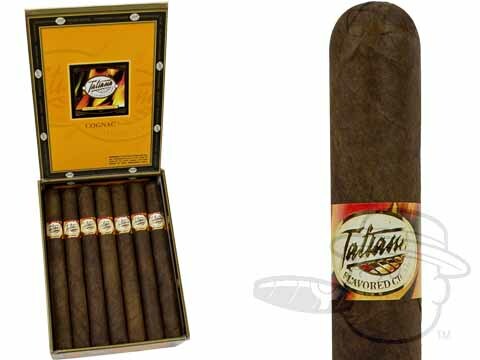 You can pick up a box any time here at BestCigarPrices along with many of the other Tatiana flavored cigars.